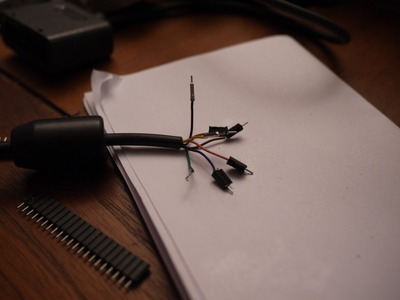 Abstract: I transform a Playstation/parallel port converter to USB. This includes finding the pinout of the previous circuit, making an AVR toolchain work, and writing the firmware. Some bugs are found, and fixed. The result is open source. Do you pine for the days when people were people and wrote their own device drivers? Some days are still like that, you just have to take the opportunity. Recently while organizing my place I found two abandoned items that were meant to meet each other: a Dance Dance Revolution mat and a Teensy++ development board. This project is the story of their union. 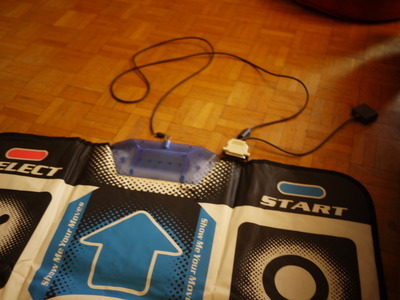 So, I stumbled upon an old DDR mat and I wanted to play with it. The easiest way is using Stepmania, a simulator that works on Linux (and that I am trying to package for Debian). But some interface is needed to connect dancing mats (usually made for the Playstation) to a computer. 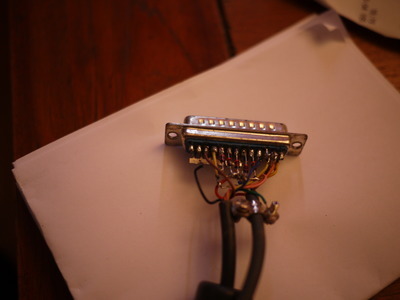 In a previous life I replaced the Playstation connector of this mat with a parallel port connector. In the beginning of the 2000s, the popular circuit to do this was Direct Pad Pro, and on Linux there was a similar driver documented in joystick-parport.txt. Needless to say, I do not have a parallel port on my computer anymore, so some conversion is required. I also happen to have a USB development board on hand, so a possible solution is to program it to drive the Playstation mat. On the above picture, two things are connected to the parallel port: the DDR mat and a female SNES connector. The driver indeed supported several gamepads, even of different types. Looking at the kernel documentation, it means that the 11 is the data pin for the Playstation connector (the SNES pad was #1 and the PSX pad was #2). This was enough to reconstruct the correct pinout. Note that the kernel numbers PSX pins in the opposite order of everything else I have seen. The following table uses kernel order. At first, I was worried by the green wire that was not connected but this confirms that it was not needed. The Data signal is the only one that goes from the Device (DDR mat) to the Host (microcontroller), but since each pin can be used as an input or as an output, this does not constrain the choice. So, let’s connect the DDR mat to the microcontroller. As the board already has male pin headers for breadboard usage, I soldered female pin headers to wires. Female pin headers on wires. A bit backwards, I know. The completed adapter. 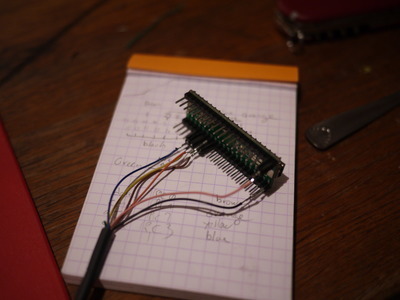 The spoon was used to unplug the board from a piece of breadboard. And for breakfast, earlier. The second quirk is that most of the documentation that can be found is for using the teensy++ as an Arduino. But I prefer writing low-level code: just memory-mapped registers, a C compiler, and me. So I aptitude-installed gcc-avr and avr-lib and opened vim. To do that, the library has a mapping from pin numbers (an Arduino-specific terminology, it seems) to register names. Time to write the code itself. My absolute reference for programming and interfacing the Playstation is Everything You Have Always Wanted to Know about the Playstation But Were Afraid to Ask. See section 9 for controllers. The idea is that every frame (16 ms), Select becomes low, and bytes are transfered, LSB first, in a synchronous way over the Command (D→H) and Data (H→D) pins. Select becomes high back again after all bytes are transfered. wait half a clock cycle. Keypress information can be found in the 16-bit number (data2 << 8) | data1). If a bit is 0, it means that the corresponding button is pressed. At first, it was not obvious how to debug the implementation of this protocol. Fortunately, this microcontroller has a USB port and it is possible to transmit debug messages using the usb_debug_only code sample from the manufacturer. With no real surprise, my first iteration did not work and printed the following. I was not putting Clock back up. I was using PORTC for reading input even though PINC was needed… the registers are mapped in memory but not at the same address for reading and writing. Rookie mistake. The output bytes correspond to the device ID part (41 5A) and a value (FF DF) that indicates that nothing is pressed except the Circle button. At that moment the firmware just computes the result and prints it over USB. To do something useful with it on the computer side, this information needs to be exposed as a USB joystick or keyboard. I used the usb_keyboard code sample which exports a usb_keyboard_press function. This is simple, yet it works quite well and is enough to play Stepmania! I noticed that however it does not work perfectly since the key is released immediately: this is a problem for DDR since the patterns where you have to hold keys do not work. When usb_keyboard_send is called, it transmits the contents of keyboard_keys over USB. All nonzero elements correspond to keys that are pressed. So what this function does is transmit a state where a key is pressed, then transmit a state where nothing is pressed. it does not work if several keys are pressed at once. It would be nice to implement n-key rollover (NKRO) so that all keys can be pressed independently. This is possible, by increasing the size of keyboard_keys to 14 (the number of keys on a Playstation gamepad). But this means fiddling with the USB descriptor code, so that the USB host side can know how many bytes to expect, and I am not really comfortable with that. In the library, the size of keyboard_keys is 6, so I stuck with 6-key rollover which ought to be enough for everybody. The keypress_add function walks the keyboard_keys array and replace the first 0 with the correct button. keypress_remove does the opposite. And… this works! I found this very refreshing to write low-level code for an existing, documented protocol. If you are interested, all the code can be found in this github repository. Thanks for reading!